Kim Jacobs Calloway, senior vice president of Allie Beth Allman & Associates, is a native Dallasite and second-generation Realtor. Having grown up in a retail-oriented family, and by working with her mother Doris Jacobs, exemplary customer service is in Kim’s blood. Kim has been a Multi-Million Dollar producer for her entire real estate career of more than 21 years. 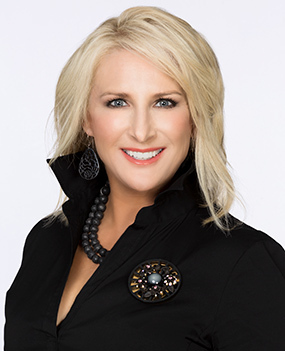 She was named Director Producer for Allie Beth Allman & Associates from 2004-2017 and has been named one of the “Top Residential Real Estate Agents in Dallas” by D Magazine every year, including in 2018. Kim dedicates 110 percent to her clients – often relying on referrals and repeat business. She has a knack for developing such strong relationships with her clients that they usually turn into trusting friendships. Kim specializes in the Park Cities, including Highland Park and University Park, Preston Hollow, Devonshire, Bluffview, Greenway Parks, Turtle Creek, Uptown, the Dallas Arts District, M Streets, Lakewood and North Dallas. Kim graduated from the University of Mississippi in 1989 with a dual major in Fashion Merchandising and Interior Design. After working as a buyer at Neiman Marcus in Downtown Dallas, she decided to utilize her talents and business savvy to join her family in the real estate industry. Her eye for design and architecture has not only helped her become a success in real estate, but in renovating houses as well. Kim is gifted in realizing the potential of each property for her clients and making the impossible work in every space. Kim is also very devoted to charitable organizations in the community including the Cattle Baron’s Ball, Nexus, The Shelton School Auction, KidneyTexas, Inc., TACA, Conservancy Member of Arlington Hall, Dallas Historical Society, Pregnancy Resource Council, The Family Place, Tri-Delta Dallas Alumni Association, Friends of the Katy Trail, Turtle Creek Association, Park Cities Republican Women and Texas State Society. She is also a member of Highland Park Presbyterian Church. Kim’s most important role is being a mother to her son William, 21, and she enjoys being involved in every aspect of his life, from school to sports and activities.